If you’re in the market for a car scanner, Innova is the way to go. As one of the top manufacturers of car scanners in the world, Innova has produced countless models for car owners to choose from. The 3150 is one of Innova’s most popular offerings, but a reliable review of the product is nonetheless difficult to find. The Innova 3150 has long been a popular choice among hobbyists and DIYers as it offers a variety of features – such as an all-in-one screen, multiple language selections, and oil/battery reset – for a fraction of the price of many of Innova’s other offerings. There are three different models of the 3150 for you to choose from: a black and white screen model, a color screen model, and a Bluetooth model. As mentioned already, the Innova 3150 is most commonly purchased by hobbyists and DIYers, but that doesn’t mean it has no use in professional settings. A number of mechanics have purchased the 3150, relying on it as a secondary scanner or for their own use at home. It is important to note that despite its popularity among non-professionals, the Innova 3150 is not suited to every car owner. If you aren’t particularly passionate about cars and have just one vehicle in your driveway, there is no reason for you to spend upwards of $150 on a scanner intended for use on a regular basis. If you’re searching for a scanner that you can store away and use once every couple of months, there are many less expensive casual models for you to go with instead. 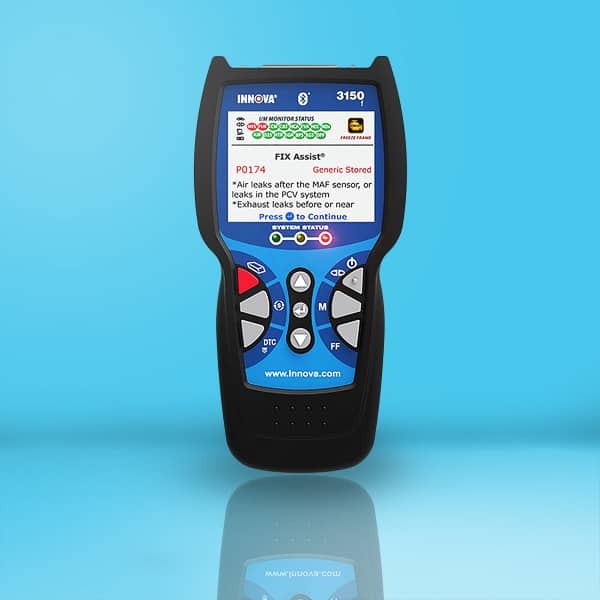 When you purchase the Innova 3150, you will receive the scanner alongside an OBD2 code reader, an OBD2 cable, a 4G micro SD card, a USB cable, and 3 AA batteries. Each model is also accompanied by a quick reference guide intended to streamline the setup process. The major selling point of the Innova 3150 is its all-in-one screen. Innova has used this all-in-one screen design on a couple of its scanners and you’re unlikely to find it anywhere else. The design is beneficial as it allows the user to read 25 vital pieces of information from the screen at one time, something usually only possible when the scanner has been connected to a laptop or tablet. Oil and battery resets are easily attainable through the scanner’s step-by-step guide, designed for most 1996 and more modern OBD2 vehicles. Similarly, this scanner boasts the ability to read and erase ABS and SRS codes on compatible vehicles, along with the ability to remedy “check engine” warnings. Should your vehicle's malfunction indicator lamp turn on, you can turn to the scanner’s freeze-frame function to determine fuel trim and engine coolant temperature, along with other engine conditions. Many of Innova’s offerings allow the user to set their language of preference from a selection of possible languages and the brand’s 3150 is no different. Test results can be displayed upon the scanner’s screen in English, French, and Spanish. Similarly, the manufacturer promises bilingual customer support, with callers having the option of speaking to an ASE-certified technician in either English or Spanish. Many of Innova’s car scanners are designed with professionals in mind, which can make finding the Innova scanner for you a bit of a challenge if you are a hobbyist. The 3150 is arguably the ideal car scanner for DIYers who want to own an Innova scanner but are not in a position to spend upwards of $200 on one of the brand’s more professional models. Rich in features despite its low price, the Innova 3150 makes it possible for the automotive DIYer to receive professional service at their own hands, minimizing the money they must spend on a scanner and eradicating any of the expenses associated with consulting a mechanic.